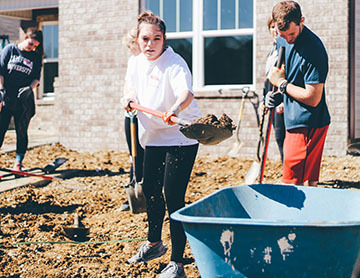 Samford University students have a long tradition of giving back to Birmingham and other communities in many ways. Recently, members of the Brock School of Business Beta Alpha Psi chapter spent a day of service building a Habitat for Humanity house in Calera, Alabama. Beta Alpha Psi encourages students to select a service project each semester. The students plan to continue volunteering with Habitat for Humanity next fall. The students spent the day leveling the yard to prepare it for landscaping. They also grouted tile, painted and installed window treatments. The house was move-in ready for the new owners—a mother and her son—by the time the students finished the day. “As service coordinator within Beta Alpha Psi, it is really exciting to see students using their gifts and passions to serve the community. We grew closer as friends through a fun day of service and also helped a family in the local community,” said McKay Richardson, a junior accounting major from Fredericksburg, Virginia. Beta Alpha Psi is an international honor organization for financial information students and professionals. The primary objective of Beta Alpha Psi is to encourage and give recognition to scholastic and professional excellence in the business information field. This includes promoting the study and practice of accounting, finance and information systems. The organization provides opportunities for self-development, service and association among members and practicing professionals. It also encourages a sense of ethical, social and public responsibility. Only AACSB-accredited business schools are eligible for chapters of Beta Alpha Psi. Samford’s Kappa Pi chapter of Beta Alpha Psi sponsors an extensive schedule of activities throughout the academic year, including monthly professional programs covering topics such as careers in accounting and finance, interview and résumé preparation, and graduate school options. The organization also sponsors an annual Accounting Career Night, which provides an opportunity for students to interact with professionals from the local business community. Hartman is a junior accounting major from Roswell, Georgia. For more information about the Beta Alpha Psi organization go to samford.edu/business. Kara Kennedy is director of marketing and communication for Brock School of Business.